If you are an artist who needs space, has lots of art supplies, and likes to move to different areas as you work, this crafting station is meant for you! This product is top quality. Its steel make and four floor levelers ensure sturdiness. It can handle large, heavy canvas pieces with wood framing, and more. 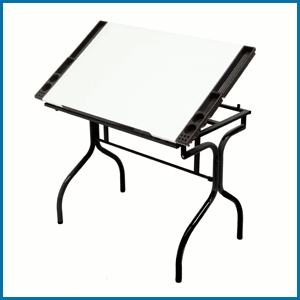 With six angle options for adjusting, it functions as table or easel. The folding legs mean you can bring it anywhere - outdoors, indoors, or on trips. It comes in wood or tempered blue safety glass, making it light and easy to carry. The main surface measures 36" by 26". This is ideal for the busy artist with lots of supplies. Four trays pop out from the main body of the station, great for storage or maximizing your work space. The 24-inch front ledge can hold multiple items you need close, such as pencils and brushes. Assembly takes only five minutes and requires no tools.